This TV is one of the latest bargain offers at the online tech stores. The LG 32LK330U TV is currently offered for about 300$. The LK3 LCD TV series is HD Ready with built in digital freeview and uses invisible speaker technology giving you great picture and sound together. 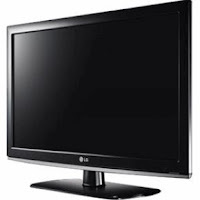 Ultra-slim and stylish, the LG 32LK330U is a 32-inch LCD TV that offers outstanding viewing effects. Design of the speaker in this LG Freeview HDTV is fashionable and more hidden compared to traditional side or bottom speaker designs. The LG Freeview HDTV has a 1366x768 pixels resolution, providing eye-catching HD images. With the HDMI and USB ports, you can pair the LG 32LK330U with a game consoles, Blu-ray player, home cinema system, digital cameras, laptops, and CD/DVD players, for complete experience. This 32-inch LCD TV comes with a universal remote control, allowing you to control the TV easily. Buy one if you need one. LG 32LK330U LCD TV - a beautiful picture at a beautiful price! The 32LK330U delivers 720 lines of resolution, for brilliantly colorful video for all your favorite shows, sports, and movies. Picture Wizard II makes it simple to calibrate settings and get the best image.